This morning after breakfast we will depart as a group and make our way to celebrate our first Mass of the pilgrimage. Over the next few days all our intentions, the intentions we carry from friends and family will be offered up at each Mass. Following Mass, we will make our way to the sanctuary area where we will have a detailed orientation tour and Our guide will explain where and why the Rosary Basilica was built and introduce us to the confessional chapel and the baths area. We will return to the hotel for Lunch which is usually served at 12 noon. After lunch we generally meet with our guide at our hotel to embark on the walking tour which follows in the footsteps of St Bernadette. 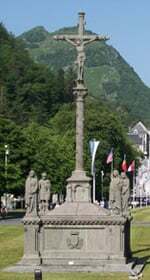 We begin at the cemetery where her parents are buried and walk back in time to visit the Boly Mill, the birthplace of St. Bernadette and the �Cachot� an abandoned prison where she and her impoverish family lived. 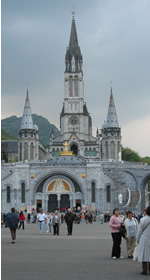 During the walking tour we will hopefully get the sense of how the apparitions had such an impact on the family and this small village of Lourdes. After our walk we can take some free time to go back to the sanctuary area for some time of personal prayer before attending the blessing of the sick. After dinner we will take part in the evening programme as per the Sanctuary schedule which is optional for those who wish to attend the Rosary and the candlelight procession, beginning at 9pm. After a restful night�s sleep, we leave the hotel as a group and visit the baths.After lunch there is an optional trip to Bartres (approximately �15 per person return for the coach trip). Bernadette held a special place for Bartres in her heart as it was where she stayed and studied the Catechism to prepare to receive her first Holy Communion. As a group we will celebrate Holy Mass in the chapel where Bernadette prayed. We shall return to our hotel for dinner at 7pm. After dinner this evening we again have an opportunity to take part in the evening programme as per the Sanctuary schedule. 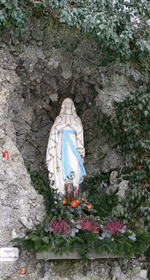 We will begin today at the most sacred site at the sanctuary of Our Lady of Lourdes, the grotto where Our Lady first appeared to Bernadette in 1858. During our time at the Grotto we can walk in and around the Grotto area placing our hands on the grotto walls where the original spring is still visible. There is also an intentions box situated within the Grotto area where we can leave our intentions. Attend Mass in the Lower Dolores. After lunch we will meet up as a group at St. Joseph's Gate with our guide and participate in the High or Low stations of the cross. The high stations are life size figures which re-enact the passion of Christ. They are located at the top of the Rosary basilica hill and will take approximately 1.5hr to complete. The low stations are located across from the baths area and have been designed to facilitate anybody who may have any walking difficulties. Both the high and low stations are an opportunity to experience Christ�s unconditional love for us all as we pray together on the passion through Our Lady�s eyes. After dinner we again have an opportunity to take part in the evening programme as per the Sanctuary schedule.